Interactive POP Kiosks Engage Your Customers and Boost Your Sales. award-winning interactive POP kiosks which will set your sales on fire. There is nothing more inspiring or memory-triggering, than catchy, innovative and entertainingly interactive POP kiosks. We’ll base your design on a proven methodology which has repeatedly increased customer interaction and sales for our customers. 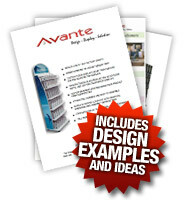 Download the catalog today for examples of how Avante increases sales and brand recognition with engaging design. We’ll expand your bottom-line profits with cost-effective, in-house manufacturing, inclusive shipping and delivery. We take your exciting design ideas and transform them into an interesting and innovative POP kiosk which cements brand recognition in your customers’ subconscious. We specialize in repeat sales generated by interactive POP kiosks that linger in the minds of the public. You get a single point of contact for easy project management. Designers for your point-of-purchase displays take what proved to work best in previous projects, and integrate them into the most effective and efficient sales processes ever offered. Predictable human behavior is combined with statistical results offering a guarantee of increased sales and brand recognition. Our interactive POP kiosk displays take up less room to make the most of what your retailers give you. Avante interactive POP kiosks use space-saving designs which optimize the most effective elements of your advertising design. Avante’s excellence lies in the life-long background of the founding brothers. Raised as cabinet makers in their fathers retail store—they learned the design advantages of visual placement. They combined this with the cost-effective economic and environmentally sound MDF. For over 26 years Avante has focused on manufacturing unique POP display solutions. Solutions which trigger increased sales and have been recognized with international design-quality awards, patents and a growing list of client success stories. Quality materials are just as important as design. This is the reason we are sought by leading product manufacturers across virtually every retail market. Experts know brand recognition depends entirely on the quality of the retail display and interactive POP kiosk designs. The unique sales purchase happens when people are caught off-guard by sheer excellence. This is an advantage that Avante has learned to reproduce regularly. Our award-winning designs vaulted many companies into entirely new levels of success. There is no other way to generate the cost advantages we offer. In-house design, manufacturing and shipping, are all components that other POP display companies tend to “farm out”. This leads to added costs and reduced quality. We keep it in-house for faster turnaround, unparalleled quality control and a more affordable investment for you. A permanent display with fully-integrated 3-D graphics immediately increases the perceived value of your products. The touch, sound and feel as the customer interacts with your kiosk satisfies their curiosity and builds desire for your product. We combine communication of need, with fascinating ways to educate about that need. This produces consistent results that have earned us our international reputation. We design success into your kiosk from start to finish. This methodical strategy with effective & efficient processes, gets your kiosks on-site quickly to start boosting your sales. We have learned how to best support your company by making our company the only one you need to boost your brand. Get stunning point of sale purchase kiosks. We effectively and efficiently communicate your brand to your ideal customers. Call Avante POP Displays toll free 1-877-407-8655, download the brochure today or contact us online for a quick quote.